Are you looking for a meaty feast? 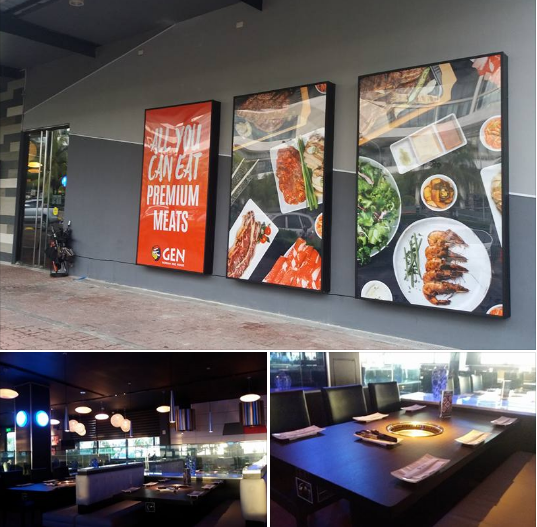 If you love grilled meats, then Gen Korean BBQ House is the best place for your pigout sessions. With GEN’s premium quality meats, seafoods and side dishes (banchan), you are getting the best for what you paid for. At 500 seating capacity, GEN is definitely the biggest Korean barbeque grill buffet I have ever been to. Guests may opt to dine in long tables equipped with stainless steel vents that can seat 10-12 individuals, or in a 6-seater table with cushioned seats for a more relaxed and intimate dining experience. Each table has built-in grills with perforated dome griddles that may be changed from time to time. Other diners may choose to stay at the bar or lounge in clustered sofas and watch TV. Gen Korean BBQis a franchise from from the United States that best exemplifies a successful fusion between cultures. 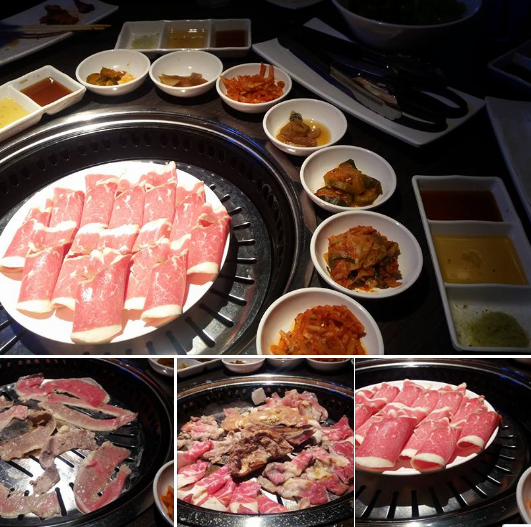 GEN Korean BBQ House offers a wide variety of marinated and un-marinated barbecue meat cuts and seafood options. Their carnivore menu includes beef, chicken, pork, prawns and cuttlefish all-you-can-eat meats. 25 dishes are available for lunch time at P798++ per person. 35 dishes are available on weekends, holidays, and dinner time at the ratr of P1288++. The menu provides a brief description of each. You can start with non-marinated cuts first, then move on to their marinated ones, which really make a difference! Boldly- flavored marinades add savory depth to the grilled meat.The adventurous eaters can go for the cow intestine or opt for pork belly marinated in red wine They even have cooked viands like the Honey Chicken and Chicken Poppers that immediately satiate hunger pangs. Chadolbegi is a dish made from thinly sliced, unmarinated beef brisket. It cooks in an instant as soon as it is placed onto the heated grill plate. Samgyeopsal is thick strips of unsalted pork belly. Its fatty content makes it tender. If you love steaks, then go for the Top Blade Premium Steak. It is a top premium meat cut that comes in super tender and juicy once done on the grill. Loins (deungshim, 등심) and boneless ribs (갈비살) are also a popular choice for an unmarinated type of gogigui. The grilled meat is usually wrapped in lettuce leaves with kimchi and gireumjang (salt and black pepper in sesame oil) or samjang (soybean-chili paste) in the Korean style. Their banchan buffet extends well beyond kimchi. Korean BBQ dishes are served with lots of vegetables such as lettuce, perilla leaves (kkaennip), pachae, ssukgat (crown daisy), Gamja Sarada (Korean- Style Mashed Potato Salad) with ssamjang (sauce for wraps). You should try to mix the grilled meats with all the unlimited banchan or Korean appetizers served around the table. For the party animals out there, #PrimetimeFridays is the day for you. Every Friday, aside from having delicious meals for your palatte, you get to enjoy hot new hits played by select djs. So what are you waiting for? Head on over to SM by the Bay and get a taste of what GEN has to offer. You can never go wrong with Gen Korean BBQ House. Thank you for posting about this place. The ambiance of the restaurant looks great. Can’t comment much on the food but I like the way the interior is done. This dish looks pretty interesting and I am sure that having dinner organized in such a way makes all people able to have something good to be enjoyed.